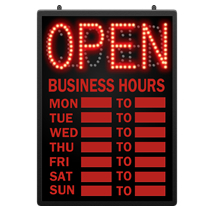 OPEN CLOSED sign with Business Hours is made with super bright LED technology. Dual lighted design allows for the Business Hours to stay lit when OPEN is turned off. Features wording that reads OPEN in orange and CLOSED in red. Write on/Wipe off area for your store hours. 50% brighter than neon, use 50% less electricity, doesn’t get hot so you can leave it on 24 hours a day 7 days a week. Open Closed sign can flash and blink. Power Supply Input: 120V. Includes hanging hardware and marker.